Dermot MacMurrough- Traitor Of The Irish? 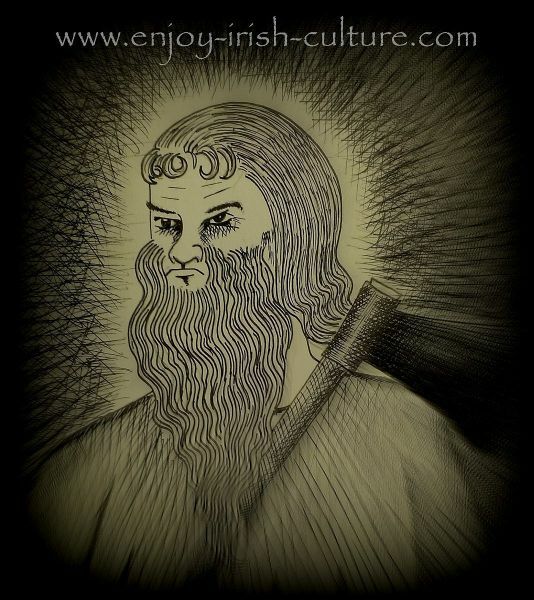 Dermot MacMurrough, one of the most infamous of Irish leaders, reviled by many, credited with inviting Norman invaders to Ireland, was born on 26th June 1110. Portrait of Dermot Mac Murrough. Artist impression by Colm Sweeney. As a boy Dermot MacMurrough saw his father killed by the Hiberno-Norsemen of Dublin, his body buried beneath their assembly hall with a dead dog, as a mark of disrespect. Every time they would assemble in their great hall, they would walk on Dermot’s fathers’ bones. These early experiences of humiliation must surely have had an influence on the man Dermot would become. Later, Dermot became chief of the Ui Ceannsallaig dynasty and his base was Ferns, county Wexford. Mac Murrough was known as a ruthless man, killing anyone who stood in his way or blinding and castrating potential rivals. It was said of Dermot that he would rather be feared than loved. He gained a reputation as a fearless warrior always hoarse from shouting his battle cry. In medieval Ireland, the Abbeys were very important symbols of kingly power, and in 1132 when a rival clan had a woman appointed to the position of Abbess of Kildare, Dermot was enraged. He attacked and plundered Kildare and had the woman raped, so as to invalidate her right to the position, and to ensure that he did not lose control of this important office. It has to be said however, that doing business in this most cruel manner was not exceptional by any means back in the day. By the middle of the twelfth century however, with his behaviour Dermot had made many enemies and eventually his day of reckoning came. Ireland was a country with many Kingdoms in an almost perpetual state of conflict. As a means of ensuring peace for a time the Gaelic Irish used a system whereby high profile hostages, usually family members were given to the man with the upper hand, to deter further conflict. Dermot MacMurrough was the king of Leinster, a region of Ireland, which included the Viking city of Dublin. 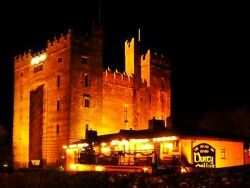 In 1152, as the result of a dispute with his bitter enemy, Tiernan O’Rourke, King of Breifne, Strongbow resulted to abducting his enemy’s wife, again, nothing unusual for the times. The abduction was all the more galling for O’Rourke by the fact that his wife Dervogilla did not seem to mind the imposition. But in the long run, this insult cost Dermot MacMurrough his kingship. He was eventually defeated by the High King of Ireland Rory O’Conor in 1166 and deprived of his Kingdom of Leinster. His next move was to leave Ireland in 1167 to enlist the assistance of Norman knights to regain his kingdom. Dermot MacMurrough first sailed to England to seek help from Henry II. I’d like to emphasize that there were no Nation states back then. Henry II was a Norman King who spent most of his life in France, not England. France was where McMurrough found Henry II, submitted to the king and asked for help in regaining his kingdom. Henry was not interested in a conquest of Ireland, but he did grant MacMurrough permission to seek help from some of his Knights. Eventually, MacMurrough found support from some Flemish and Welsh Knights, led by ‘Strongbow’. The next chapter in the story was the Norman invasion of Ireland starting 1169. With the help of the invaders, Dermot captured the towns of Waterford, Wexford and Dublin and, as one may imagine, the man that he was, took revenge on those who had opposed and betrayed him. Dermot MacMurrough gave his daughter Aoife’s hand in marriage to Strongbow and named him publicly as his successor to the Kingdom of Leinster. Dermot did not live long however to enjoy his re-discovered power. He died in 1171 and was buried in the cemetery Ferns Cathedral, where you can see his grave today. His legacy was an island forever changed. The Norman invasion set the scene for the later colonialisation of Ireland under the Tudors andunder Cromwell. furthermore. with successive waves of Norman invaders, castle building really took a foothold in Ireland. In the context of the times, Dermot was doing what probably most any man in his position would have done to win back his kingdom. Deserted by his allies at home, he went abroad to seek outside help- strong outside help. Unfortunately for the Irish aristocracy this outside help happened to be the most ruthlessly efficient and technologically advanced fighting force in Western Europe, and conflicts which up until this point were domestic, were now transformed dramatically.